If I had to describe the Saint Pablo Tour in a phrase, it would be “delightfully minimalist.” For anyone that knows anything about Kanye West, you might find it strange that I am describing the show as minimalist, but Kanye used two things, and used them well. He had no opening act, and nothing but a floating rectangle for a stage. He had a light strip that spanned the length of the floor, and planned its light very well. It provided visual intrigue through angles, and set the tone or provided ambience; whatever West wanted at that time. It didn’t matter where you were, you got a taste of Kanye. By not having a set main stage, he was able to truly lead the crowd, and provide some level of intimacy for all. Anytime I see GA for the Air Canada Centre, I cringe. Sure, you’re on the floor, but you still have a seat to “sit” in. My boyfriend and I went to the ACC for Day 2 of Drake‘s Seventh Annual OVO Fest / Summer Sixteen Tour on August 1st of this year. We were not on the floor, but not a single person in that venue spent any time in their seats as soon as “Summer Sixteen” was cued. However, for the Saint Pablo Tour, there was not one chair on the floor, and Kanye spent the duration of the show floating over the crowd. We were very close to the floor, and it was mesmerizing to watch people follow the platform that Kanye stood on, while partying underneath it and around it. For me, seeing Kanye West in concert is something that I have wanted to do since the release of his first single “Through the Wire” in 2004. Sure, I was only ten years old but even then, the music and creative genius of Kanye West was something that resonated with me, especially as a young musician myself. I saw the track as a message to creative minds to keep creating and keep pushing themselves, no matter what sort of boundaries are presented. Kanye didn’t take the stage until 9:37 p.m. Before that, we waited in line for probably the most original concert merch I have seen to date, let alone had the privilege of purchasing. Normally when you buy a concert tour tee, it has all of the dates and location listed on the back of it. 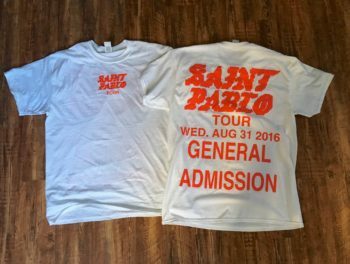 These t-shirts are exclusive because they say the date of the specific show that you attended on the back. If that isn’t a tangible memory, I don’t know what is. I know it sounds cliched, but this show was life-changing. It was incredible to watch one individual perform with such passion, vision, and precision. He opened with “Father Stretch My Hands Pt. 1” and included the original gospel song that was sampled for that, making it the most epic concert opening I have ever experienced. West flowed right into “Pt.2”, then right into “Famous.” After all was said and done, all he had to say was, “That was just the intro. 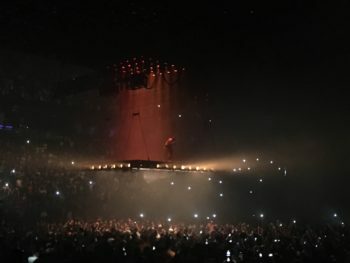 Welcome to the Saint Pablo Tour.” He took no breaks aside from letting the audience enjoying a lighting transition show, and performed at least one track from nearly every album. We got features, including his verses from “Pop Style” with Drake and “tHat Part” with scHoolboy Q. Every second was an intimate experience of epic proportions. Paradoxical? Enigmatic? Original? All of the above.